As organizations move towards a hybrid and integrated model for their data center landscape, the focus on operations has become even more critical. Data center teams are removing existing bottlenecks in the capacity planning process by leveraging a single platform that unites process and engineering under one roof. With R13, we are advancing the concept of the digital twin for the data center to bring these teams closer than ever before. At the heart of the process is 6SigmaAccess, our browser-based planning software. We have put considerable effort into improving its functionality, both in terms of security and usability. Dashboards: 6SigmaAccess now includes dashboards that show critical data such as power, space and cooling at both the individual data center and overall portfolio levels. This view has been developed for managers who need to track the performance of the data center over time. Included in the dashboard is the ability to view the trends associated with installations and decommissions of cabinets and IT equipment. Weight Module: In data centers where weight is a limiting factor, the weight of cabinets and IT equipment must be considered as an important factor during planning. Weight limits can now be added to cabinets, which are automatically considered when planning to deploy a new item of IT equipment. If the planned weight exceeds the available weight in the cabinet, a red cross will appear next to the Cabinet Weight Limit when hovering over the cabinet to indicate that it cannot support IT equipment of this weight. Power Module: As part of our aim to make 6SigmaAccess a next-generation capacity planning platform, we are porting over key features from 6SigmaRoom. Users can now add new servers to cabinets and connect the power cords to the appropriate rack PDUs. The proposed deployment can then be passed on to 6SigmaRoom for further investigation, ensuring the integrity of the overall power network. Model Grouping: The added benefit of the model store server is that Admin users can now group users and models together. For example, Admin users can now restrict users’ access to a certain group of models within the entire portfolio. 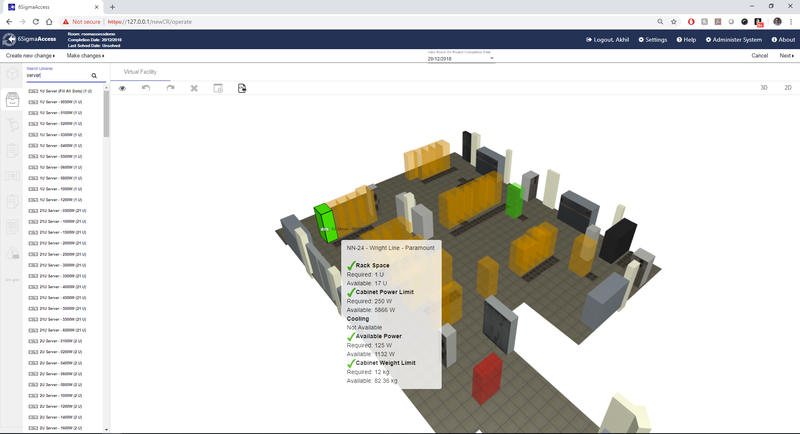 We are moving at a fast pace to develop improved features for 6SigmaAccess, placing the digital twin concept at the heart of data center capacity planning.